So, I have been thinking for a while to start writing and sharing my love for food with people. But life as it says, or we like to say it keeps coming in between. We are often caught up in the everyday swirl of getting up,getting the chores done,running for office,coming back home and retiring to sleep. But we eventually do find time to pursue what gives us inner peace and ultimate happiness. Food to me is everything. I love to cook and bake beautiful food as much as I love to eat it. Going to the vegetable vendor and seeing the wide array of beautiful colors spread out in form of fresh vegetables bring a shine in my eyes. Sometimes, I wonder God really does know how to make us believe in him because its only HIM who can carve out every vegetable and fruit so beautifully!!! May is yet to come and summer is already at its peak in the city of Mumbai. So lazying around this saturday afternoon, I decided to make my favourite salad "Cornflakes Salad" which i usually have atleast thrice a week. 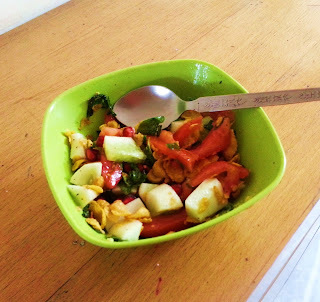 This is a simple and refreshing salad with burst of flavors in mouth. The ingredients really work together and this salad is quite filling too. In a bowl, add chopped tomatoes,cucumber,walnuts,pomegranate seeds and fresh mint. Give all the ingredients a good mix. Now add olive oil, honey, juice of half lemon and salt and black pepper(according to your taste). Give the salad a good toss so that all the ingredients are amalgamated well. Refrigerate for half hour. P.S.- Mix Cornflakes right before serving! !